Parks Candles’ ’3 Tots’ Gift Sets are not merely sets of candles. Each tot is handcrafted to set free a specific combination of scents and improve the atmosphere (both literally and figuratively) of any internal space. Every tot we produce is poured by hand into a fine glass votive mini vase. It will typically burn for 8 hours, either continuously or a bit at a time. Trimming will not be necessary due to our premium smoke-free, soot-free, all-natural cotton wicks. 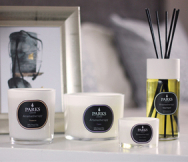 This set consists of three ‘tot’ size candles in one of our most popular scents – grapefruit and jasmine. Jasmine has been grown for its perfume for more than 1,000 years in Southeast Asia. Our jasmine scent is harvested using traditional methods and is, therefore, not an essential oil. Our suppliers instead use a complicated distillation process that is nearly as old as the scent itself. The field of aromatherapy uses jasmine to sooth and calm, and even to fight inflammation or pain in the joints and muscles. Some even laud its aphrodisiac properties. Grapefruit has a lush citrus scent with none of the bitterness of the juice. It has been used for centuries to reduce inflammation, fight stress and even promote weight loss. The combination is a subtle yet powerful scent that remains as fresh as the day it was poured, even if your lucky recipient somehow manages to avoid using them for years. The Parks Candles’ Grapefruit and Jasmine 3 Tots Gift Set ships in a presentation-quality gift box.